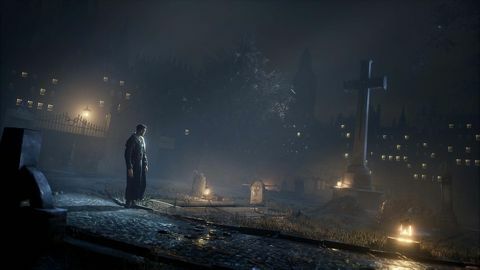 Amid the clatter of E3, a quiet and moody demo for a little game called Vampyr stood out from the crowd for all the right reasons. A third-person action-RPG from Life is Strange studio Dontnod, it is set in London 1918, and casts the player as Jonathon Reed, a brilliant doctor who has returned from WWI only to be turned into a vampire against his will. A compelling dichotomy is quickly set: the good doctor is torn between his desire to help those stricken by the Spanish Flu epidemic and – in his own words – “the gnawing hunger inside me… every night it must be appeased”. In other words, he must take lives in order to survive and gain power, but each time he does so, it has an affect on the London ecosystem. The demo opens with Reed standing over the grave of a woman named Mary as her casket sits on the freshly dug soil. As we stare down at her coffin, we converse via dialogue wheel with Lady Ashbury, another vampire masquerading as a human, and one of the game’s main NPCs. She knows we are hiding something horrific, and recommends we go to the church to confess. The choices we make not only in conversation with her but in the wider world impact our relationship, so we head in the direction of the chapel. On the way, we happen across a group of vampire hunters gathered around a bonfire – members of a secret society sworn to cleanse the streets. At the beginning of the game, nobody but the vampire hunters are aware of vampires in London, and Reed intends to keep it that way. In fact, he's seeking a cure for his own vampirism. Dontnod has designed combat to be and challenging and dynamic, but this encounter is short and savage, with the hunters hopelessly outclassed by a teleporting Reed. He softens them up with a cleaver, before using his fangs to finish them off – a risky move that takes previous seconds, but which gains him vampire blood. It allows him to summon a shadowy spike upon which one particularly unlucky chap is impaled, and it's immediately clear blood is a resource that can turn the tide of a battle. Should this have been a fairer fight, positioning and timing would have been key, and Dontnod quickly adds that the level of enemies adjusts to maintain a stiff difficulty throughout the game. 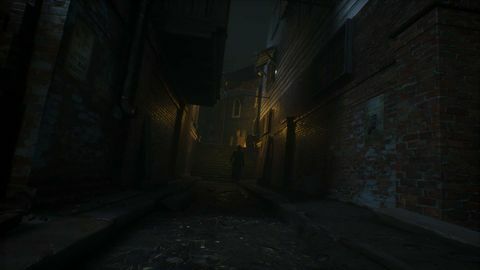 Vampyr is semi-open world, with the player free to roam its interconnected hubs, and these also serve as grounding for a neat game mechanic. Each district has a score based on the average health of citizens, and you can try to heal the sick to keep the balance when you take a life or three. 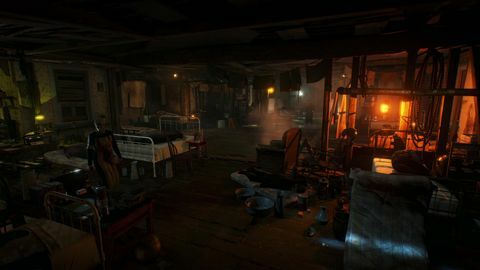 Kill too many, and you’ll lose that district altogether and be treated to a suitably downbeat cutscene showing bodies burning and survivors crouched in squalor. This outcome is made doubly depressing by the fact that all the game’s citizens have “names, jobs, personal relationships, issues, relatives and friends” according to Dontnod. But this isn’t just to induce pangs of guilt when you feast on the neck flesh of solo mother Emily and leave her infant howling in its crib. Rather, you can shadow or insert yourself into the life of almost anyone, get to know them, and from there, decide who you can bear to kill and – more importantly – who deserves to die. 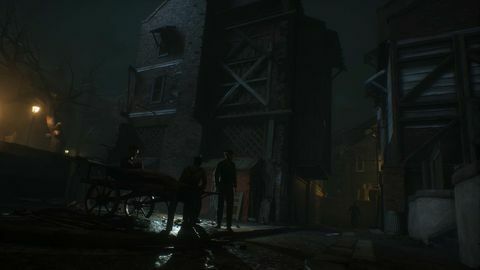 In the demo, Reed chats with a builder on a darkened street, making inquiries as to the health of his family. We are angling for an invitation into his house so we may inspect and then devour his sick son, as we figure that’s no great loss – the flu will claim his soul soon enough anyway. (It’s worth noting that vampire lore dictates that we must be invited in – we cannot simply cross the house’s threshold ourselves.) However, this guy’s the standoffish type, and a few rude words are spoken that moments later he’s sure to regret. Losing patience, we use our mesmerize skill to take control of mind, coax him to the nearest dark alley, and drink his blood away, from prying eyes. Killing him gives us two experience points to spend on skills, and his death has a ripple effect on the rest of the hub: a shopkeeper now has more items as the builder is no longer around to intimidate him, but the builder's son must now navigate this sinister world without a father, and the district's death toll has crept up a notch. “There is no good or bad choice, only ambiguous ones,” says Dontnod. 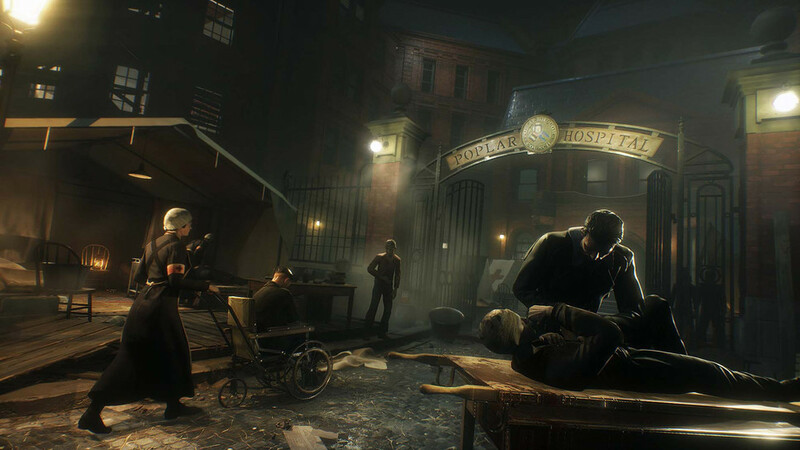 ◆ Vampyr is coming to Xbox One, PlayStation 4, and Windows PC next year.